Learn from well-known local experts on topics such as pollinators of North Central Texas, potted plants, Texas trees and more. Attendees can question a panel of experts about gardening issues during the Ask the Experts session. A conservation garden tour will follow at 1 p.m. The Trash Bash at Walnut Creek is a two-part cleanup. Volunteers may register to pick up litter while exploring either the Walnut Creek Hiking Trail or the Walnut Creek Paddling Trail. Afterward, volunteers and the community can celebrate a clean community with a party on the beach! Starting Sept. 4, drop in during visiting hours to learn about the Biodiversity Education Center, Coppell Nature Park and the seasonal programs offered. While you're here, learn about the local environment through self-guided activities and interactive resources. Then, take what you learn out on the trails to become true EcoExplorers! Check our Facebook page for weekly themes. EcoExplorer is open to all ages, but children must be accompanied by an adult. Free admission. Every Tuesday, Thursday, and Saturday, from 9 a.m. to noon. Community welcome to bring old bills, statements, checks, credit card offers, tax info, letterhead, brochures, file folders, post-its, paper, newspaper, envelopes, photos for shredding. Free. Event lasts until 1 p.m. or the shred truck is full. Learn the basics and benefits of rainwater har­vesting and reduce the effect your stormwater has on the environment. Participants will learn how to collect and utilize rainwater at home. This class is hands on “DIY” where each participant will build and take home a 55-gallon rain barrel at $50 dollars each. Rain barrels are recycled food-grade containers and are roughly 24” wide by 36” tall. This is the first ever VegFest in Oklahoma City and we are thrilled to be here! This festival serves as a time to celebrate, educate and promote plant-based foods, animal rights and environmental sustainability. There will be food, cooking demos, fitness, speakers, and a whole lot of fun! All welcome. Free. Shredding is limited to 5 (banker box size) boxes per vehicle. All major credit cards, cash and checks are accepted. $5/box. Bob Richie is an expert on the natural world around us - even here in our neighborhood! This class will start with a quick botany lesson on how to positively identify the plants we're seeking, then we'll hit the sidewalks to look for fresh and tasty plants growing naturally in our area. Bob will also discuss useful and medicinal plants found in the area too. Experts, owners and enthusiasts will be in attendance to answer questions and give visitors the chance to ride in or drive the vehicles. This experience will provide many with the opportunity to learn and explore these innovative vehicles. Those interested in learning more about EVs are encouraged to attend. Having a raised garden bed at home is a terrific way to grow small plots of flowers or vegetables without the clutter of many containers throughout your yard. A raised garden bed can provide better control of the soil quality and it is easier to remove weeds. Pre-registration is required through the City of Coppell Activities website. 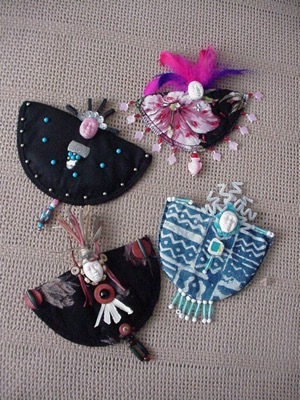 Learn to design and create a small fabric doll with a twist, using various adhesives along with sculpted faces, embellishments of buttons, lace, flat gems, trimming and beads. Join us for this family-friendly workshop with Dallas recycle artist VET. Everyone will take away a small art doll suitable for framing. Free. Peruse botanical art and artists during Fort Worth's Fall Gallery Night. Enjoy 'Two Views. Botanical Sculpture by Trailer McQuilkin. Botanical Art by Ann Ekstrom' in the Madeline R. Samples Exhibit Hall and 'Symbiosis' by Erika Duque in the Welcome Center Gallery. We'll also have a pop up exhibit by the Fort Worth Art Collective and a pop up artisan market by 817 Arts Alliance. Doors open at 4 p.m and our reception starts at 6 p.m.